Today is a hard one for me. A few days ago I posted on Instagram about how in yoga there is always a deeper place to go. And this passage, Exodus 12, is just that. There is depth here that we can only scratch the surface of. Arborvitae means "to sacrifice." It is known as the oil of Divine Grace. It is said to help those who are struggling in their own efforts, to sacrifice their need of control, and surrender and trust in the power of God. Put a few drops in your diffuser and inhale deeply. 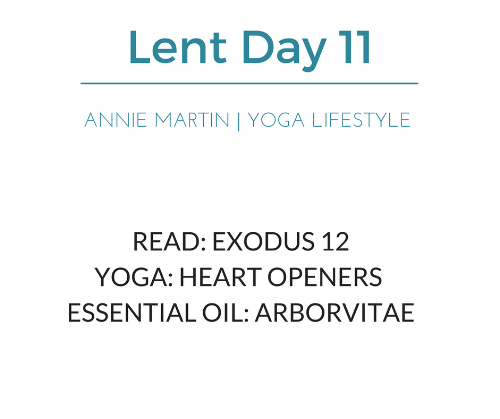 Find a comfortable seated position and read through Exodus Chapter 12. Let the word of God fill your heart and move in grace. As you move, add a few heart openers to your practice. Take them as deep as your body is willing to go. Exodus chapter 12 is rich. Every detail of this story is pointing to the cross of Jesus. But here, we're going to stay close to the surface. Rest assured this passage will come up again in soon. It's going to be a theme for the rest of our time together in this Lent series. Let's back up to chapter 4:21-23 here, the first time Moses stands before Pharaoh, God tells him whats about to happen. Give me my firstborn son or I'll take yours from you. Then again in chapter 11 God tells him again. He gives Pharaoh a way out. And again he hardens his heart. Pharaoh chooses, after everything he's seen God do through the other 9 plagues, to ignore this warning. And inso doing, incurred the wrath of God on his own first born son. All of the 9 plagues before this, God allowed showed distinction between Egypt and Israel not because of anything Israel had done, but simply because they were the people of God. This last plague, Israel would only survive if they were obedient to this act of faith. And it's the only plague they are called to remember ... in great detail. He gives instructions for the remembrance before it even happens. And he changes the way they see time. He calls them to alter their calendar and make this now the first month of the year. This is a new beginning. Everything from here after will now be measured by this moment. The moment God frees them. I also want to point out that every time Moses goes to Pharaoh, he calls for the Israelites to be set free in order to worship God. Let us go out an make a sacrifice to our God. And because Pharaoh continues to harden his heart, the first sacrifice was made in Egypt. The people of God are called to sacrifice a spotless lamb, to paint the doorpost of their homes with its blood (a public covering) and to roast it with fire and eat it all that night. In haste. Here again we see a substitution sacrifice. Instead of God killing their firstborn, the lamb is given and they are covered by the blood of the lamb. Every house covered by the blood was passed over and protected from the wrath of God. Every detail of this story points to the cross of Jesus Christ. Every single detail. Go back to chapter 4:21-23, go back to chapter 3 when God tells Moses everything that is about to happen. Go back to Genesis 15 when God lays out his plan perfectly. Every detail of this story has meaning and purpose. Every part of it was planned out by God beforehand and foretold so that we might know and understand the glory and majesty of God. And that we might trust him. Friends, through the death and resurrection of Jesus Christ, through our act of faith and surrender, he becomes our sacrificial lamb (1 Corinthians 5:7). And we are covered by his blood and rescued out of slavery and from the wrath of God over sin. He meets us where we are in the middle of our slavery and we sacrifice our way for his way there and then we are set free. We are not ever called to free ourselves because its not in our power to do so. Rest in that today. Open your heart to that today. We are set free by the power and grace of God through the cross of Jesus Christ, Gods long awaited, firstborn son.